Thought Leno's jokes the late night wars were bad? With Call of Duty: Modern Warfare 3, they just got worse. 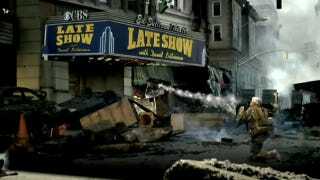 On tonight's Tonight Show, Leno mentioned how big Modern Warfare 3 was. Instead of showing the actual game, Leno showed the live-action commercial, with his head superimposed. The clip climaxed with Leno firing a rocket into the Ed Sullivan Theater, where late night rival David Letterman hosts The Late Show. The audience broke into applause.